Winter in New England can be long, dark, cold and dreary, to be certain. 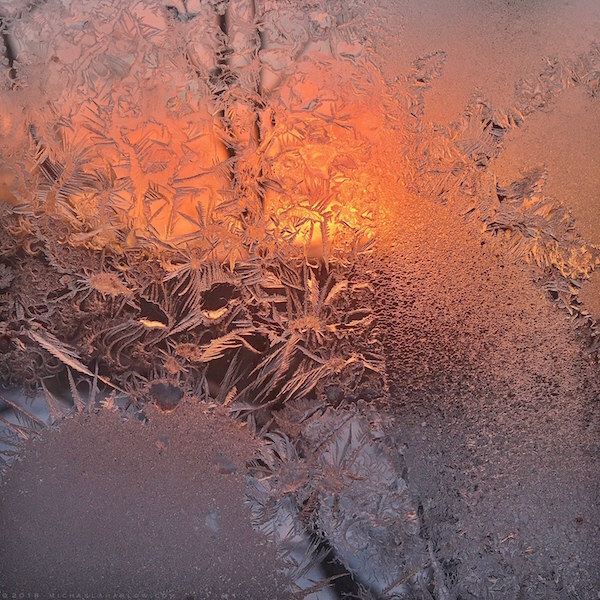 But if you are a lover of magical, frozen landscapes, beauty also abounds. By mid-February, I often find myself feeling a bit house-bound and restless. The cure for cabin fever? 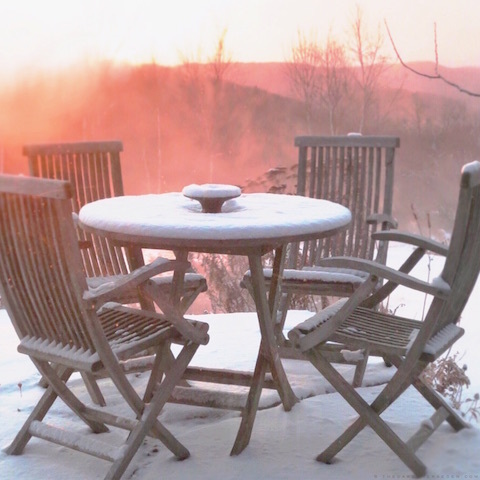 Why a garden walk and a bit of mid-winter pruning, followed by hot cocoa in the lounge chairs of course! 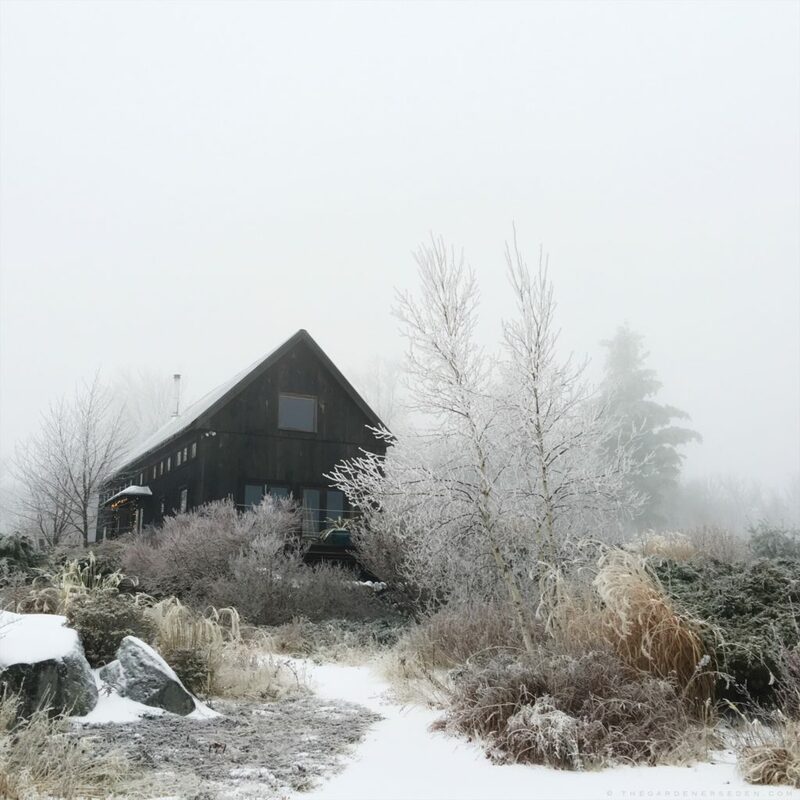 If you design your landscape with winter in mind —keep those frost-proof pots and weather-proof furnishings in the garden— there’s plenty of beauty to take in while stretching your legs out-of-doors. Things looking a little ho-hum out there? Well now’s the time to take notice. Grab your camera, as well as pen and paper, then head outside for a good, critical look. When shopping for plants this spring, pay close attention to bark color and texture. 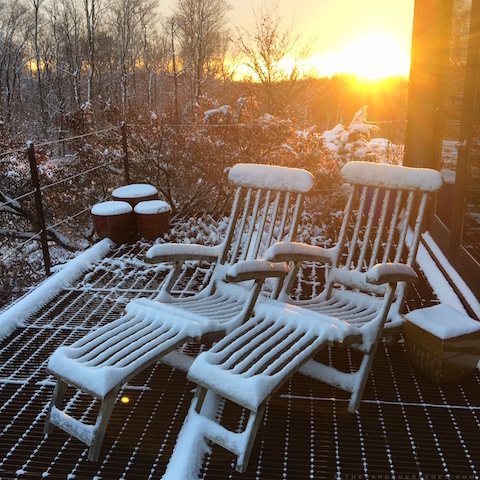 Perhaps it won’t matter much in May —especially when compared to all of those bodacious blossoms at the garden center— but come January, you’ll be grateful for the advice. Some of my favorite shrubs, such as Cornus sericea or Cornus alba, while not unattractive during the growing season, are really nothing much to look at in June and July. But when those autumn leaves drop and the fog rolls in? POW. Another design tip worth sharing? Think texture! Layer your garden with nubby, fluffy, spiky and bristly trees, shrubs, perennials, vines and grasses. 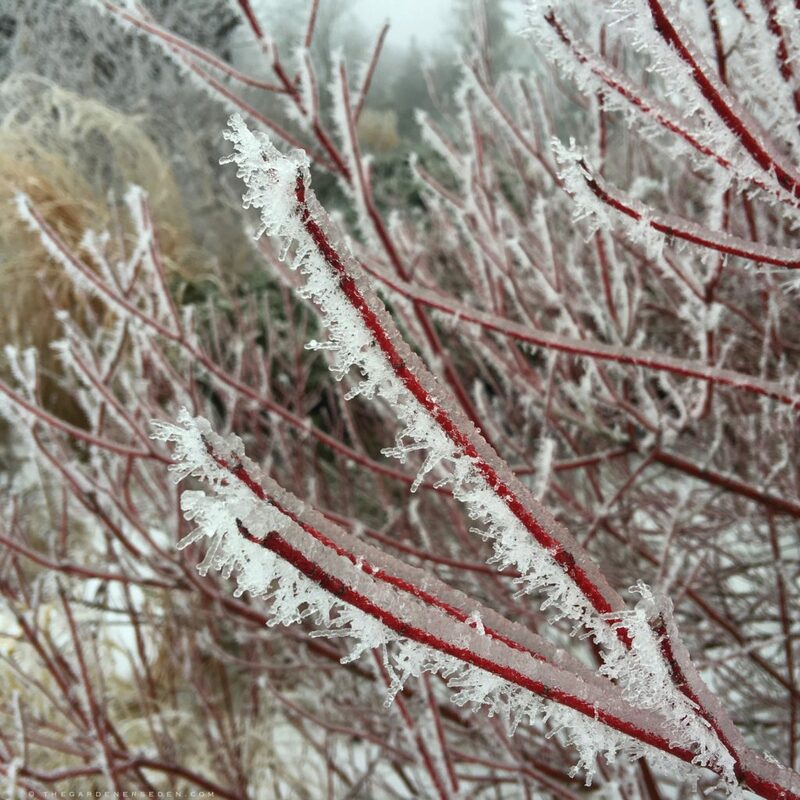 Plants with rough textures really catch the frost, snow and ice. There’s nothing better for creating a magical, winter wonderland. Mix conifers among the deciduous shrubs and perennials —especially those with colorful textures, bark and/or berries— to create contrast and depth. Creeping, horizontal and upright Juniperus, Taxus, Microbiota decussata, Picea abies ‘Nidiformis,’ and Pinus mugo are just a few garden-worthy species that will add tremendous winter delight. Looking for shrubs with colorful fruit? Travel back in time to my post, “Oh, Tutti Frutti: It’s Candy Land Time! Magical & Colorful Ornamental Berries” for more ideas. 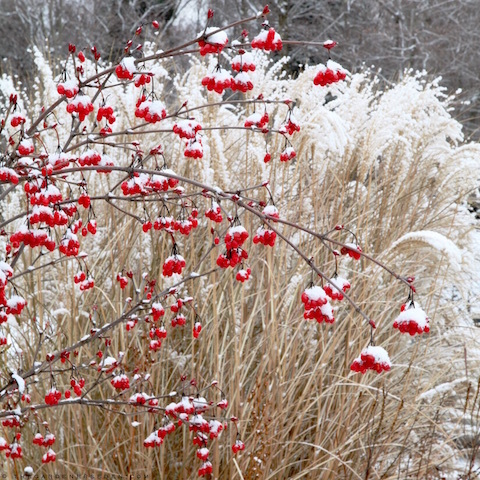 In addition to trees and shrubs, there are so many winter-garden-worthy perennials plants, vines and ornamental grasses to consider when designing a four-season garden. Pay attention to species with semi-evergreen or evergreen foliage, large or plentiful seed pods —particularly the tough, bristly types and dark, smooth ones!— as well as grasses with durable stems, tufts and blades. Some long-standing, perennial favorites? Actaea, Amsonia, Baptisia, Coreopsis, Echinacea, Echinops, Echiveria, Eryngium, Eupatorium, Humulus, Hellebore, Liatris, Nepeta (especially taller species), Rodgersia, Rudbeckia, Salvia, Sedum and among others. 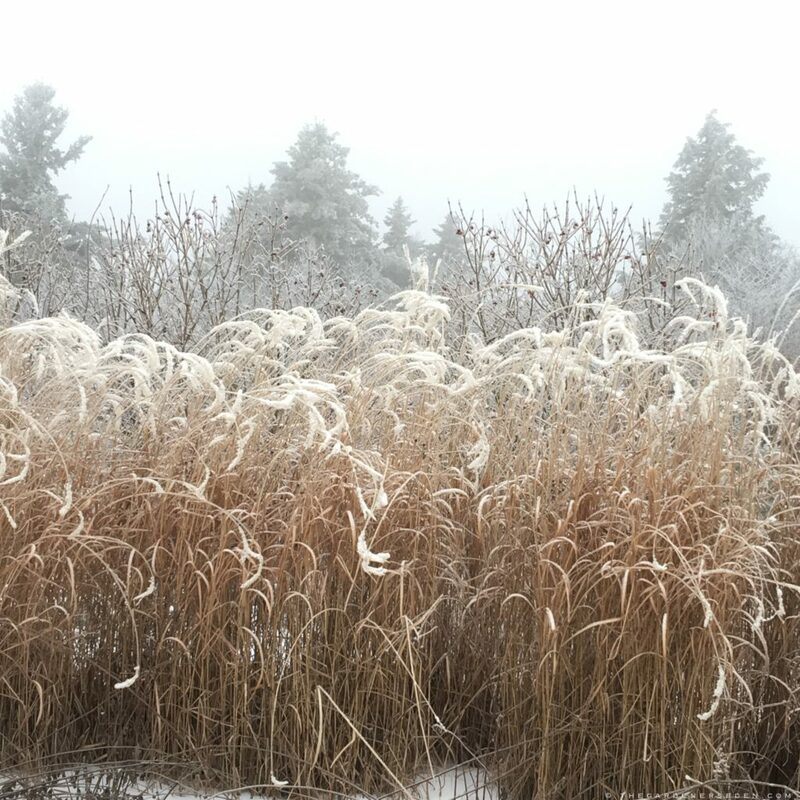 As for ornamental grasses …Oh my, where do I start? I love our natives —including Panicum, Pennisetum, Calamagrostis, Carex, Chasmanthium, Festuca and Schizachyrium— but also adore exotics, such as Miscanthus and Hakonechloa. It all depends upon the location and look you are trying to create. Tea Viburnum (Viburnum setigerum), is a Knock-Out from November through February. Colorful Berries Really Show-Off Planted with Buff-Colored Grasses or Green-Grey Conifers. Delight! 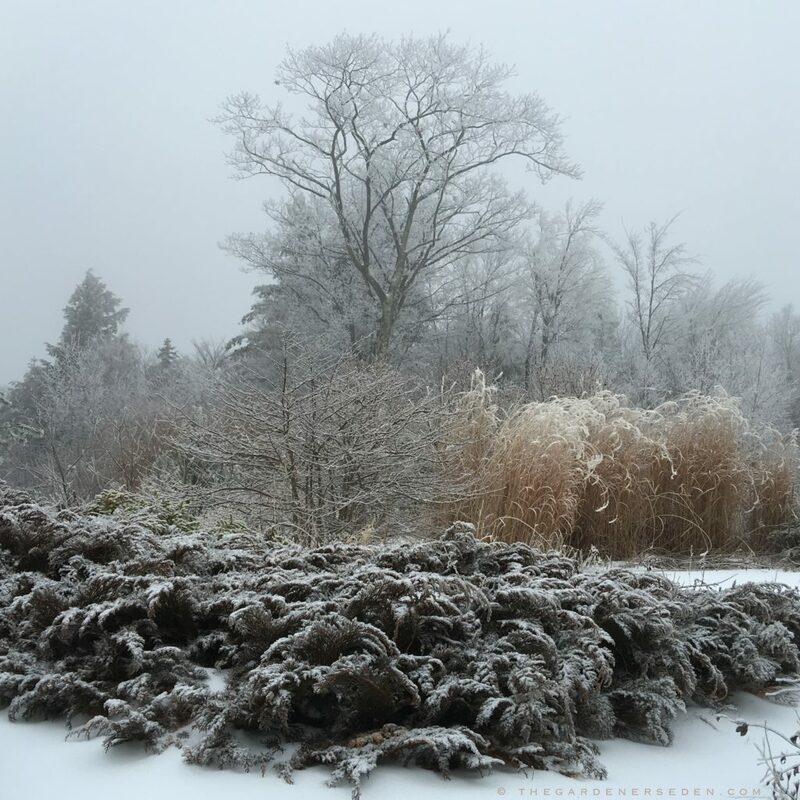 Of course, the most important aspect of winter garden plantings is location! Place these valuable additions to your garden design where you will be able to enjoy their colorful bristles, bark, berries and structural lines. I like to locate plants with winter-durable fruit, interesting seed pods, peeling bark and texture outside my favorite windows, where I can enjoy them throughout the year. Entryway gardens are always good spots for plantings, to be sure, but also mix winter interest plants thoughtfully along main walks and garden pathways; positioning them near kitchen windows, bathrooms and in places where you might spy them while doing paperwork at your desk. It pays to plan now, and make notes for spring planting season. 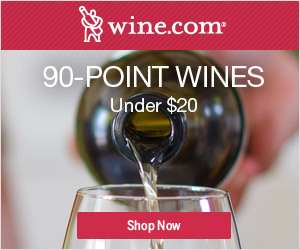 Rosé for Breakfast? Why Not? Even if I’m Stuck Indoors, This Garden Vignette, Visible from My Windows, Fills Me with Joy. You are currently viewing the archives for Saturday, February 17th, 2018 at The Gardener's Eden.